After being stuck in the upright position for hours on Wednesday, Green Bay’s Main Street Bridge is operating once again. 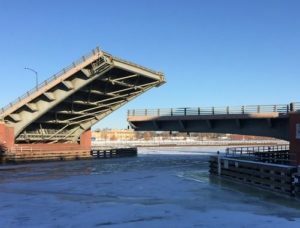 City officials say the extreme cold temperatures caused problems with the hydraulic fluid in the bridge mechanism, with sensors stopping the bridge from working in order to prevent damage. Green Bay Public Works says a tripped breaker was likely the cause of a malfunction of the The Ray Nitschke Memorial Bridge. “We anticipate that when we got to do lift bridge operations, at cold temperatures, we’re going to have issues, and we know it,” said Steve Grenier, Green Bay Public Works Director. Officials say the bridge was raised to allow a tugboat through, but then got stuck. “I told staff, we got it up, leave it up. Let’s not play around. Let’s leave the bridge up, until we get that ship in. That way we don’t have to lift it,” said Grenier. By afternoon, the bridge was open for traffic. “Ideally, I don’t like operating the bridges in these temperatures, but product is coming in. We got a commercial port here….so it’s just one of those things you deal with,” said Grenier. This year alone, nine unplanned repairs have been needed for the bridge.